Sock Monkey Workshop: Thurs June 10th, 7 – 10pm. The relationship between humans and animals has long been a topic of avid interest in art and academic discourse. Representations of animals in fine art can be traced back to the earliest drawings on the walls of caves, suggesting that they were the first metaphors, acting as ritualistic stand-ins and sacrifices for the gods. While animal depiction has shifted schematically each century, in accordance with transforming cultural norms, the animal world has continued to exert a significant influence on the collective imagination. 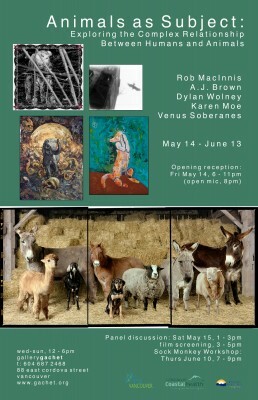 This group exhibition features artists who address this complex subject from a contemporary standpoint, exploring the interplay between humans and animals within the current cultural climate: Rob MacInnis, A.J. Brown, Karen Moe, Dylan Wolney and Venus Soberanes. In John Berger’s important essay “Why Look at Animals?” he examines the particularly modern phenomenon that is our relationship with animals. For him, this new relationship is tied to the emergence and dominance of contemporary capitalism, “by which every tradition which has previously mediated between man and nature was broken.” Before this, animals “were with man at the centre of his world,” productive, familiar, and utterly necessary. This separation reflects a deep polarization that has developed between humans and the natural world, a split that influences all realms of life. Yet in spite of this divide, animals continue to influence us at a powerful symbolic level, and in recent decades, questions surrounding their treatment have become hotly debated. The concept of animal rights has arisen in conjunction with, and as a response to, the normalized cruelties of industrial farming, scientific research and the fashion industry, industries which use animals in a detached utilitarian manner corresponding to the values and forces of contemporary capitalism. The artists in this show attend to this imbalance in diverse ways, addressing issues of animal presence and subjectivity, the symbolic influence and value of animals, and inter-species friendship and compassion. Karen Moe’s constructed images from her new series, “Wilderness” pointedly grieve the absence of animal life in modern life. Her photographic portrait collages of “food” animals, wild flowers and hand-written text by Canadian Eco-feminist poets, Di Brandt and Catherine Owen, challenge the perception of animals as objects to be consumed, suggesting instead that animals are subjects to be acknowledged. Part of Moe’s praxis is to attempt the depiction of farm animals as creatures that exist independently within their own realm, while at the same time to document their existence alongside human beings as ‘presences among presences’. Dylan Wolney’s paintings explore the complexity of the natural world, and assert its importance to his sense of self-reflexivity. Using elements of Shamanic tradition, ornament, baroque sensibilities and archetypal symbolism, he highlights the transcendent, spiritual allegiance between man and animal. Venus Soberanes’ super 8 video work focuses on the interactions between city-dwelling animals and the people who live alongside them. This video installation seeks to visually explore the aesthetic relationships between the city – a geometrical, inorganic construction; and the animals that accidentally inhabit it – organic, colourful, tragically beautiful and fully alive. None of these artists employ a simple romanticism in their renderings of animals; rather they acknowledge the complexity of their subject matter, not least of which is the present state of animal subjugation. This state is reflexive as well: we human “masters” are profoundly affected by the imbalance we have created. Each artist addresses this state of affairs in their own unique way, raising questions regarding our treatment of animals, and exploring the importance of animal presence in the human collective consciousness.